Drag the Attributes icon into the Node Graph. In the Attributes Panel click the Add Attribute button. Define the name, type and properties of the new attribute. 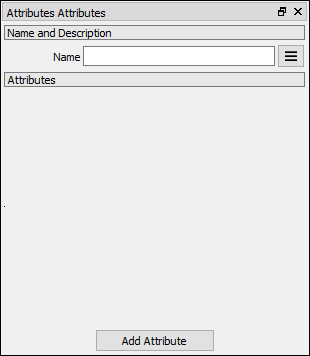 The new attribute is added to the Attributes Panel and a new output with the name of the attribute is added to the node. The Attributes node outputs all its attributes directly. attributes The attributes panel displays all custom attributes. The Add Attribute button displays the Add Attributes window. Name Name of the new attribute. The name of the new attribute must be unique across the project. 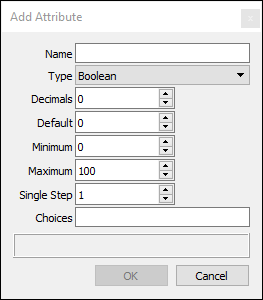 Type The type of the new attribute: Boolean, Number, Point, Frame, Rgbo, String and Choice. Decimals For numeric attributes the number of decimals to display in the ui. Minimum For numeric attributes the minimum value of the attribute. Maximum For numeic attributes the maximum value of the attribute. Single Step For numeric attributes the amount added or subtracted to the current value on a single click on a spinner button. Choices A comma separated list of strings. e.g. one,two,three,four. Choice attributes are output as String attributes. Nodes that support Choice attributes receive as input a string value and translate it to the defined choice.